Upon entry you are struck with the low hum of music, gently lulling you into the rich journey through texture and technique. 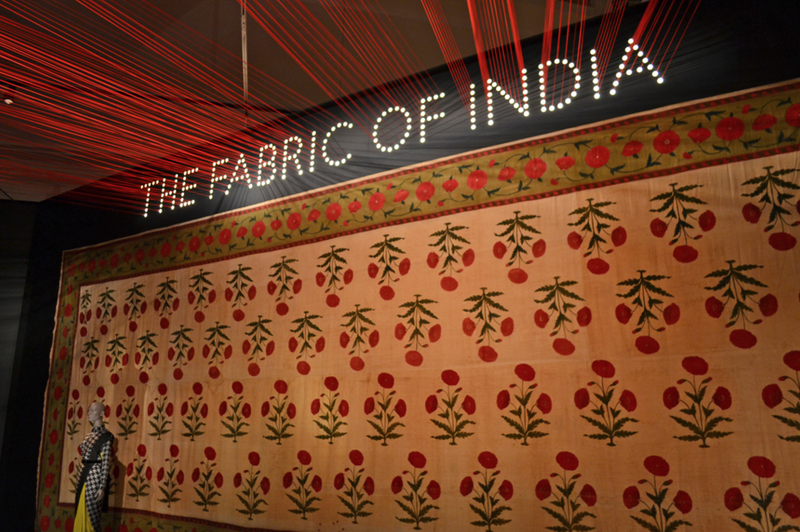 Spanning from the 3rd Century through to the present day “The Fabric of India” Exhibition at the V&A was always going to be high on our hit list of must-see exhibitions. In an industry where man is often replaced by machine, “The Fabric of India is an awe inspiring reminder of the capabilities of the human hand. Something that resonates strongly with us here at Cloth House. As supporters of the makers and artisans that craft and weave by hand, many of our products are made in this way and arrive to us directly from the hands of India. Humans’ incredible knack of capitalising on readily available raw materials helps to further communicate the journey of the textiles. 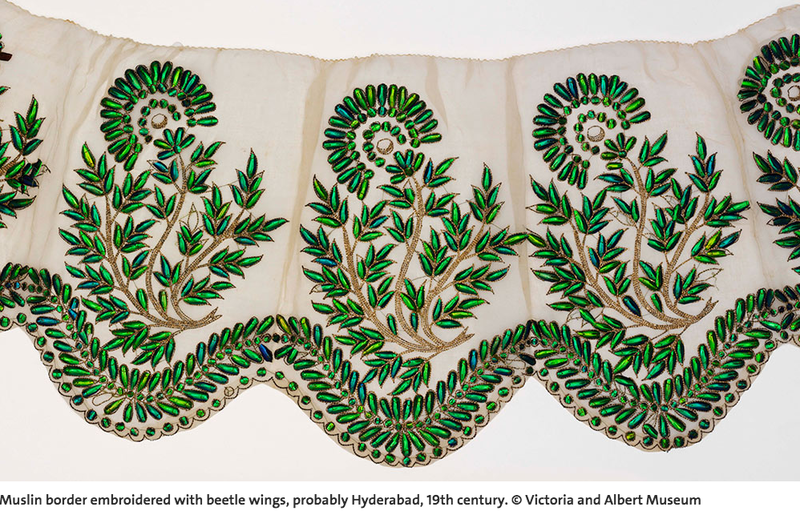 silks, cottons, wools, animal hairs and natural dyes such as madder or indigo, each process tells us its story and it is exactly this that carries you through the exhibition. Journeying from Gujarat, to Kutch to Rajastan and back. Elaborate hand finishes take residence on even the most commonplace items. Take the “Lambadi” for example. Storage sacks made by the women of Banjara, traditionally used to carry grain or salt. Such a wonderfully decorative item for everyday use and a world away from mass produced plastic food packets used in the west. Manish Arora’s contemporary examples of elaborate embellishments made a shimmering impact with hundreds of butterflies at the entrance of the exhibition. 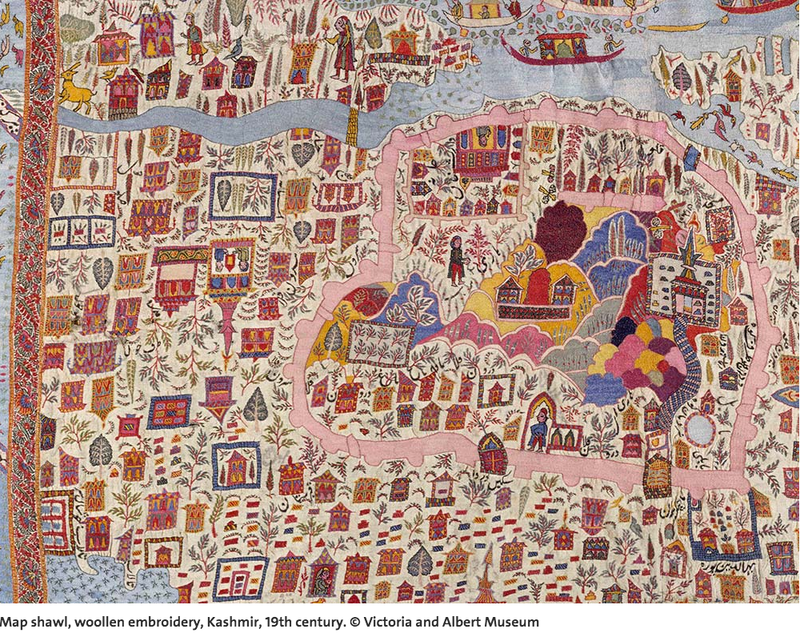 However, for us, one of the most spectacular pieces did not house the glittering sequins and gems often associated with India, but rather exhibited a mind boggling expanse of intricate hand stitching. Taking the shape of an illustrative map shawl. You can read more about our Indian kantha blankets HERE. An exhibition that is sure to inspire and evoke curiosity for traditional hand made techniques and textile stories, both historical and contemporary. “The Fabric of India” is a wonderful reminder, during a time of rapid technological advancement, not to loose sight of how special the touch of the human hand is.